GitHub - 0x09AL/DNS-Persist: DNS-Persist is a post-exploitation agent which uses DNS for command and control. Want to be notified of new releases in 0x09AL/DNS-Persist? 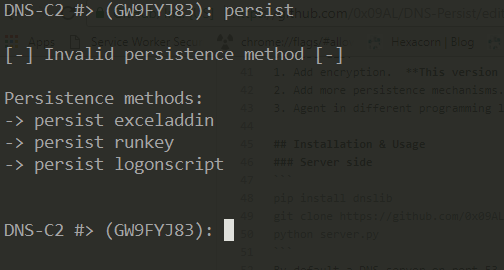 DNS-Persist is a post-exploitation agent which uses DNS for command and control. 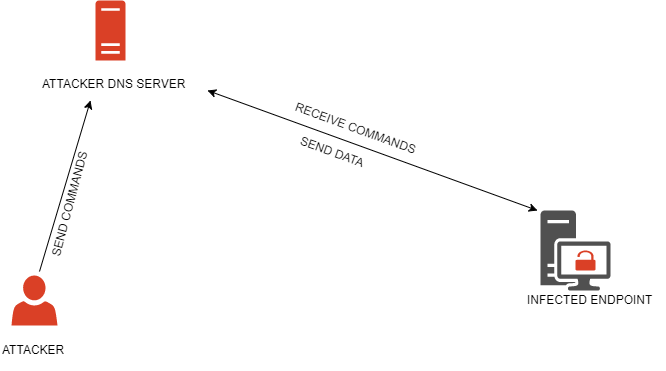 The server-side code is in Python and the agent is coded in C++. This is the first version, more features and improvements will be made in the future. DO NOT USE THIS SOFTWARE FOR ILLEGALL PURPOSES. THE AUTHOR DOES NOT KEEP ANY RESPONSIBILITY FOR ANY MISUSE OF THE CODE PROVIDED HERE. Did I reinvent the wheel ? 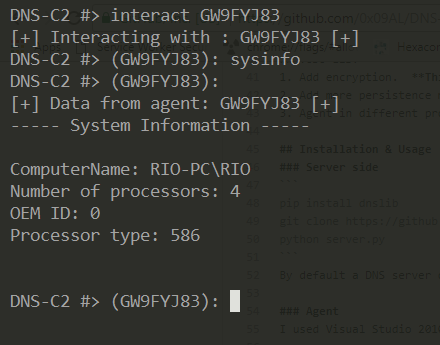 There is a lot of great work on DNS C2 but I created this software to be more focused on the persistence part. I'm no expert in C++ and this is my first "real program" in C++ (so expect some cringe worthy code). Suggestions about features and improvements are open. This version has only 3 persistence mechanisms. More will be added later. This version supports pseudo-interactive command shell that you can use to execute system commands. This version supports injection of 32-bit shellcode. The shellcode gets executed in a new thread in the same process, so crashing shellcode or invalid one will also crash the agent. Avoid NULL bytes on the shellcode. Add encryption. This version does not have any encryption so take your own risks when using it. Agent in different programming languages. By default a DNS server on port 53 will be started. You can change that on the server.py file. I used Visual Studio 2010 to code the agent so importing and compiling it should be fairly easy. Keep in mind to change the DOMAIN_NAME variable in Declarations.h, to match your domain name. The domain nameservers should point to the DNS-Persist IP address.